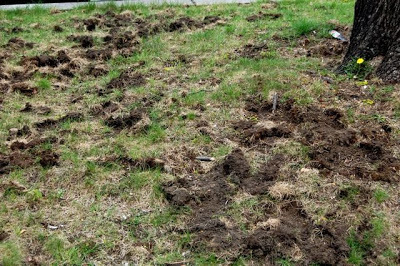 When skunks and other critters begin to forage this way in your garden, they’re actually doing you a favour… by ridding you of white grubs. That’s little consolation when you see the damage they do by digging, usually in what in most small city gardens passes for a lawn. Though the foragers will dig among all your garden plants (white grubs feed on all kinds of roots), the grub is easier pickings in the grass, which is often fighting for its life in the shade and Norway maple root competition. A healthy garden is your first line of defense against the effects of grubs and their predators. White grubs are the larvae of beetles such as the native June bug, or the alien chinch bug. The City of Toronto has some pretty strict by-laws now on what can be done to chemically control these guys, and rightly so. Pesticides kill the good, as well as the bad and the ugly. But the City also offers some good info on how to go natural. One natural treatment for white grubs is to use beneficial nematodes. These are a microscopic worm that lives naturally in soils, and preys on grubs. The University of Guelph, true to is agricultural college roots, offers this fact sheet about white grubs, including their control with nematodes. Another good reference on this, as well as on other zone-relevant natural garden care, comes from Naturally Hamilton. Follow the specific steps at specific times with these, so you don’t waste your time and money. Where do you get these nematode things? An article from the Toronto Master Gardeners recommends a product called BioSafe from Plant Products. Wasn’t able to Google a source in Toronto, though – perhaps someone out there knows where to find it. I did discover something called Grub Busters from a supplier in Oshawa. While I haven’t used it myself, if you’re really bugged by grubs it might be worth investigating. Or you can do what I do: turn a blind eye and learn to live with it. My solution is to do the old soft shoe on the lawn. Flip pieces back to being green-side up, tread lightly, flit to next piece, flip, tread, flit to next spot. Repeat. Rinse.